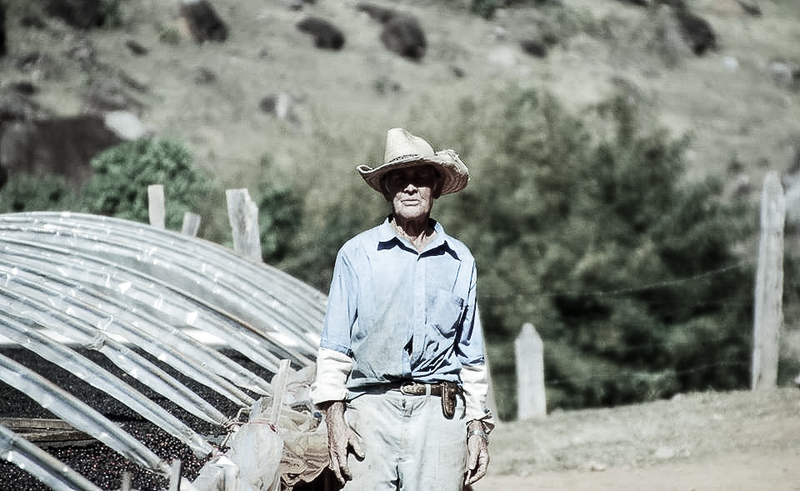 João Hamilton is one of the many farmers who partner with Fazenda Ambiental Fortaleza. Along with his brother, Hamilton inherited Sitio Canaã from his father (pictured above next to the farm's raised beds) as a conventional farm and originally sold to local coffee brokers. Since partnering with FAF, João Hamilton has radically changed his farming practices and quality measures. On his small farm, he uses no pesticides, minimizes the use of artificial fertilizer, and uses natural ground cover and native reforestation to preserve the quality of the soil. Hamilton has seen noticeable changes in the health of his trees, as well as a marked decrease in the impact of pests and disease. In the realm of quality, João Hamilton is exhaustive and inventive. João along with family and others selectively strip-pick the coffee once the cherries are purple. After picking, the cherries are extensively sorted with a small optical sorting machine, eliminating over ripe and under ripe cherries. The cherries are then placed on raised beds with a shade covers that can be adjusted up or down to monitor airflow. João and others are constantly combing the beds for under ripe cherries. This drying process takes about 14-20 days. Coffees from Sitio Canaã have been featured in the World Barista Championship as well as other coffee competitions. This lot is a small-screen blend of João Hamilton's best lots for the 2014/2015 harvest. Sweet, nutty, pie crust, peach. Balanced, good acidity. As it cooled, it finished with a pleasant dryness. Clean.